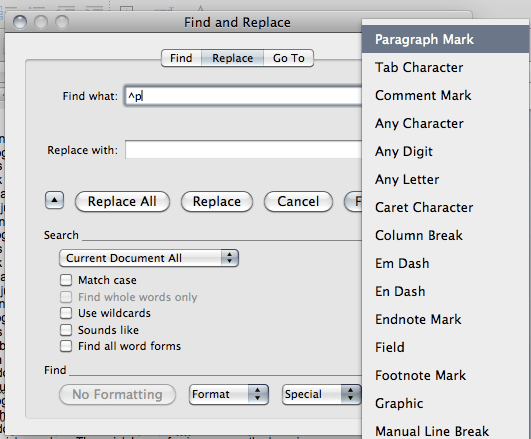 Most people know about search and replace, but fewer know that you can search & replace weird stuff like paragraph marks. This is a life-saver if you want to get rid of fixed line-breaks in text that you’ve copied and pasted into Word. It happens a lot with emails, but also with text copied from pdfs – resulting in a 25 page document that could easily be unwrapped into 4 pages. You can’t see the paragraph marks unless you press the ‘show non-printing characters’ button (see left), but if you’ve got lines that won’t unwrap, they’re probably to blame. And there you are – all back into normal text again. You can of course just type ^p instead of selecting the special menu – but it’s worth seeing what else you can search for to replace. With emails, once you’ve done this, you may still need to get rid of the chevrons (>) that sometimes get put on the beginning of every line of quoted text. † I originally had ‘put nothing in the replace box’ but two people have suggested that it’s better with a space, and I find this too, now, so I’ve changed it. This entry was posted in Advent calendar and tagged IT, IT, IT tips, MS Word, advent 2011, hints, search and replace, text-wrapping, tips on December 2, 2011 12:51 am by Jonathan Still. I really appreciated this article, as it taught me something I’ve been wondering about for a while. I used this technique to fix the hard wrapping that occurs when you copy a pdf text into word. A tiny change to the above recipe that is needed to improve this case, is to add a space in the “Replace with” field. That prevents the joining of words that will occur otherwise. Thanks for a great article! Much appreciated! It makes sense to add a space, so I’m wondering why I (deliberately – I remember) left that step out. I think I must have had a case where the deletion of a paragraph mark resulted in a space anyway, but that doesn’t sound right. YOU ROCK !!! Thank you!! !